Deadly blow to orca: blast or glancing impact? Numerous tests focused on a dead killer whale have so far failed to determine whether the fatal injury was caused by an underwater explosion or possibly a glancing blow, such as from a boat or even another animal. For the first time, all the key members on a committee studying the death of L-112 got together last week. Their latest conclusions were updated in a report released yesterday. More tests on tissues taken from the injury site are planned, even as the investigation continues into what human activities may have been occurring in or near the Columbia River at the time of L-112’s death. Veterinarian Joe Gaydos of the SeaDoc Society told me yesterday that the investigators have been unable to pinpoint what caused the extensive bruising and swelling on both sides of the head, especially on the right side. The trauma was spread out fairly evenly across the head, consistent with force from an explosion or other high-pressure impact, Joe said, but a similar injury could result from a glancing blow from a boat or even a strong impact with the tail of another whale. It was not a straight-on blow, however. Yet the bones in that part of the head were not broken, which shows that the “pressure was diffusely spread out,” he explained. I haven’t had a chance to talk with Steve Raverty, a pathologist at the Animal Health Center in British Columbia, who is studying the tissue damage. But Joe tells me that some additional tests are planned to see whether signs of blast trauma can be distinguished from impact trauma. One question is whether the injury burst blood vessels and caused blood to leak into the surrounding muscle and other tissue. That could help tip the weight of evidence. The problem is that tissue breakdown had taken place to the extent that discrete blood cells were no longer visible. With special staining techniques, it may be possible to determine whether blood had escaped into the surrounding tissue. Another test will look for fat in the blood vessels and organs, Joe said. Some previous studies suggest that explosions can dislodge blubber, leaving fat deposits that can be found later. One of the ongoing difficulties for the investigators is that the tissues were not fresh enough for them to make the finer judgments needed to rule out one source of trauma over another, although it seems apparent now that the animal did not die of disease. Aside from L-112 herself, NOAA Fisheries is trying to identify human activities, such as blasting or bombing, that may have caused the fatal injury. U.S. and Canadian navies say they were not operating in the area at the time, although the Canadians set off two underwater charges in the Salish Sea far to the north on Feb. 6. Ocean currents would not have carried a dead whale from there to Long Beach, however. Investigators are still waiting to hear whether the U.S. Coast Guard or Army Corps or Engineers were conducting any operations in the area at the time. Fishing vessels were not likely to be off Long Beach or the Columbia River in February, according to reports. There is some hope that acoustic-recording buoys in the area may have picked up the sound of an explosion or the sound of killer whales moving through the area to pinpoint the time of death. Brad Hanson of the NOAA’s Northwest Fisheries Science Center tells me that NOAA operates four buoys in the general area of consideration. The buoys stay in place and sample sounds in the water for 30 seconds out of every 10 minutes. 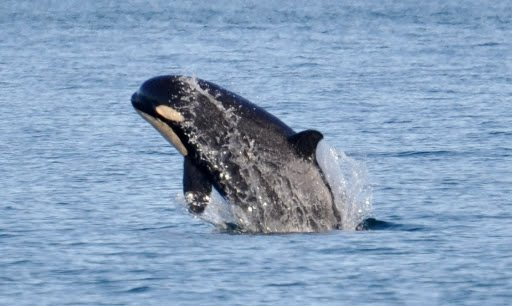 That’s one-twentieth of the time, an interval chosen to conserve hard-drive space while capturing enough information to determine if killer whales are passing by and to identify the pods if other noises do not interfere. For most of the buoys, the data won’t be available until the end of summer, when the buoys are pulled from the water and the data processed. Another coastal buoy broke loose from Cape Flattery at the northwest corner of the state during the winter and was later recovered. Brad said that data is being processed now. While it isn’t certain yet whether the buoy was still in place in February, there’s a good chance it was, since it was recovered in April. Brad said he will look specifically for sounds recorded before Feb. 11 to see if he can help solve the mystery of L-112’s death. Other recorders closer to the Columbia River may be more revealing when their data are processed later. The full report of the investigation team can be downloaded: Southern Resident Killer Whale L112 Stranding Progress Report, May 15, 2012 (PDF 72 kb). What was the pattern of trauma in the gross necropsy, as opposed to the cranial necropsy that Joe performed? Surprisingly little detail has been shared about the initial necropsy (when tissues were presumably fresher). In fact, I’m not aware of a single photo of the right side of L-112’s body — the side which apparently was most damaged. Was the pattern of trauma on the whole body consistent with the glancing blow hypothesis? Was the hemorrhage associated with air-filled organs (lungs, intestines) in the body as well as the head (mouth, trachea, sinuses, ears), as one expects for acoustic trauma? In clarifying his comment above, Howie told me that one of his references is a radio story by Ashley Ahearn of KUOW.